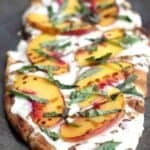 This Peach, Basil, Mozzarella Flatbread is made with fresh ingredients, drizzled with a honey balsamic reduction, and baked in the oven. It’s easy and oh so delicious! We went this past weekend and I bought a whopping 30 pounds of peaches. I’ve got peach chutney, peach pie and a whole bunch of other delicious peach recipes coming your way! And if you haven’t tried my favorite Peach Crisp recipe, you totally need to! 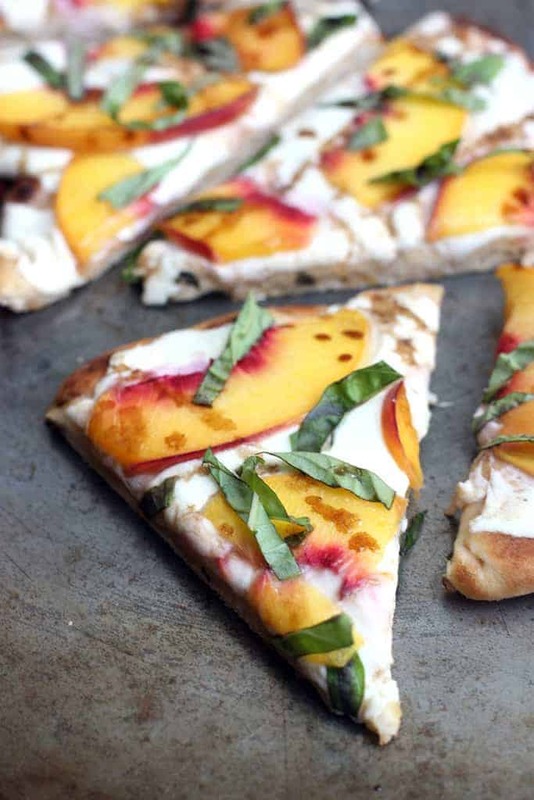 This Peach, Basil, Mozzarella Flatbread with balsamic reduction is delicious. And it’s EASY. You can make the flatbread homemade or you can totally buy a pack of good quality ones. Confession: I totally buy mine. If I’m in the mood I’ll make them “from scratch”, but Costco sells some really delicious ones, and it makes dinner a breeze. We’re talking fridge to table in 20 minutes with this easy recipe! This Peach, Basil, Mozzarella Flatbread is made with fresh ingredients, drizzled with a honey balsamic reduction, and baked in the oven. It's easy and oh so delicious! Pour balsamic vinegar and honey into a deep skillet over medium heat. Cook and simmer until reduced to slightly under a 2 Tablespoons, about 15 minutes, stirring occasionally. Brush flatbreads with olive oil. Layer with thinly sliced mozzarella cheese and thinly sliced peaches. Bake for 4-8 minutes or until cheese is melted and bubbly. Remove from oven. Sprinkle with chopped basil and drizzle with balsamic reduction. Oh, this looks and sounds delicious. It’s not even 6;00 in the morning and I totally want to make it! I think food blogging is really difficult and you’ve got it down to an art! This looks like a delicious recipe that I would DEFINITELY want to try! 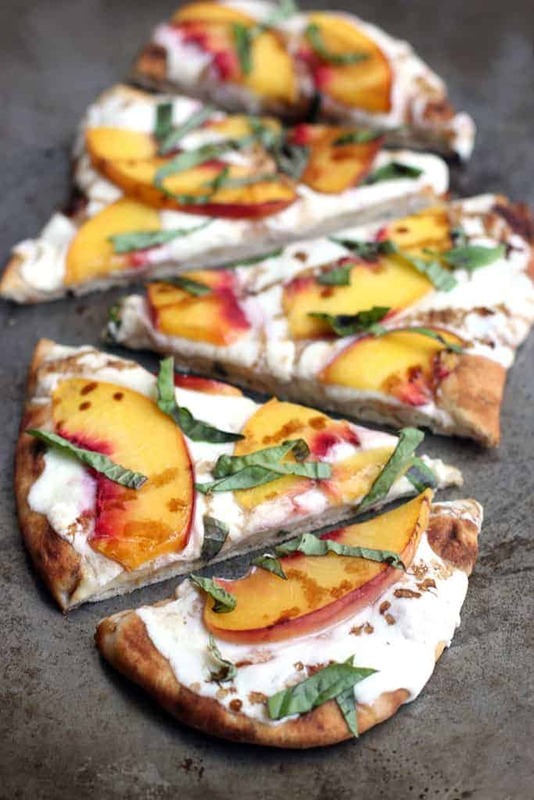 I’m looking forward to making your peach flatbread, but you didn’t mention any peaches in your instructions…. Hi Kerstin, I’m so sorry I missed that! You add it with the cheese, before you bake them. I’ve updated the recipe. Thanks! 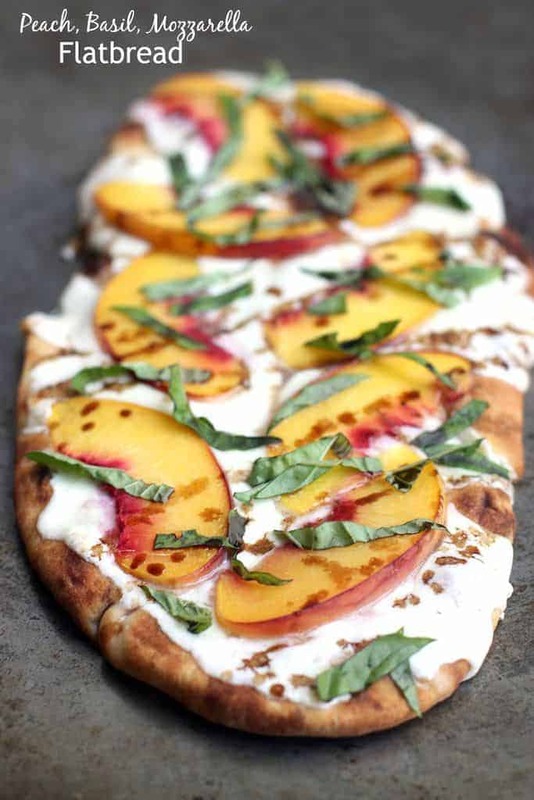 I made your Peach Basil Mozzarella Flatbread tonight … thank you for sharing! Living in Colorado, August is the time for fresh Palisade Peaches from the western slope ~ ripe, sweet and loaded with chin-dripping juice. The Grand Valley’s hot days and cool nights are perfect for bringing out the natural sugars in the peaches and growing big fruit. In comparison, peaches from other areas, I added chiffonades of Prosciutto along with the basil after taking the flatbread out of the oven. which added a depth of savory. This looks tasty. FYI, if you live near a Trader Joe’s, they have an awesome balsamic glaze that would be perfect to sub for making your own. Super tasty and so easy. I love the peach/mozz/basil/balsamic combo in just about any form. Totally making this! Are these pre-cooked flatbreads, or just flatbread dough? Hi Gaby, these use pre-coooked flatbreads! Hope you enjoy them! My husband and I love this recipe! The balsamic glaze is perfection!